There's a very fine line between life & death on Indian roads. In most cases, that line is only 6 centimeters wide and runs diagonally across our chest. Seat belts have been around since the mid-1950s. They are considered to be the most effective safety devices in cars, and can increase your chances of surviving a crash by up to a whopping 60%. Ask any statistician and he'll tell you those are pretty good odds. "First thing I did was switch off the ignition. Then I held my hand, I knew something was broken. Asked co passengers if they are ok, thank god all were wearing seat belts and nobody except me was injured." "... my car's left side had gone on the footpath as the lorry driver banged me (remember it was just 10 ft away). IT WAS A HEAD-ON ACCIDENT. The whole car went under the lorry and came out due the impact. .... Ya we had buckled up, but with that heavy monster in the front only luck saved us." "I heard a bang and the next moment I realised all this action had stopped (i.e. swirling, bouncing, crashing). I saw that I was upside down. I again began praying that I am not on the opposite side or in the middle of the highway and someone comes and bangs me. I couldn't figure out where I was (of course I was in the car). I was upside down. The first thing I did was -- started honking continuously thinking I am in the middle of road and people should get alert. Next I removed the seat belts and crawled out of the car from the driver side window which was anyway shattered." "I met with an accident earlier this year. 2 days in the ICU, 7 days in the hospital, right femur broken into 6 pieces (now kept together with a titanium rod), an open forehead (no internal injuries), a grave wound on my left knee. ... Yes I was wearing my seat belt. 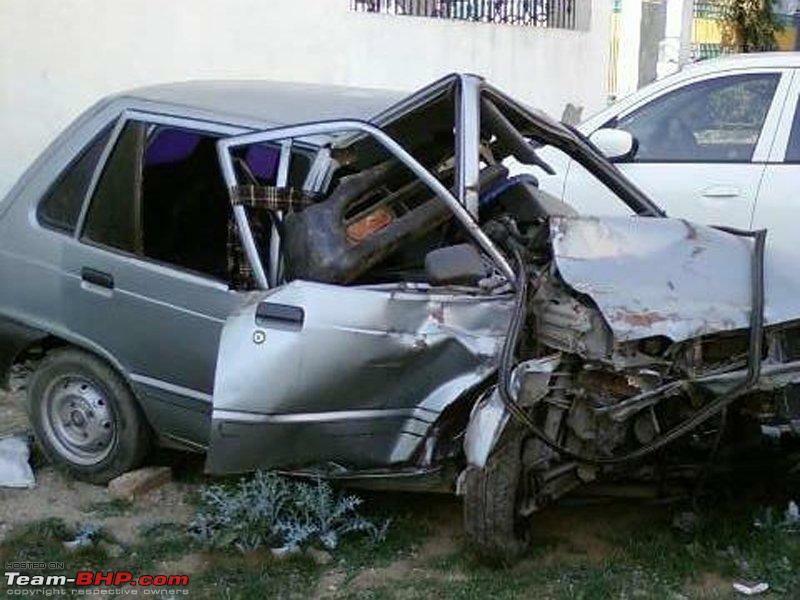 In fact the steering column had collided with the roof due to the accident. Because I was buckled up, many internal injuries were prevented. Even though my head had been cut open at a few places, I was lucky that I had no internal injuries." 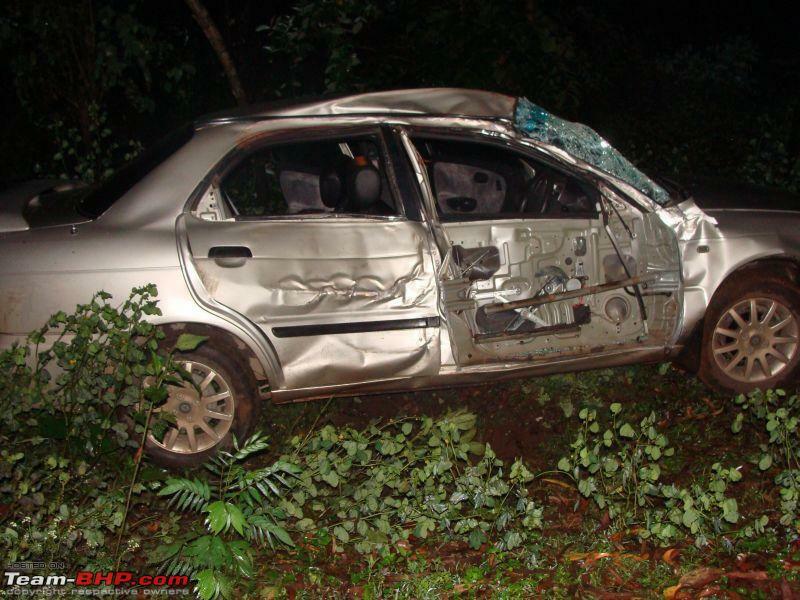 "A Maruti Swift, with 5 occupants, probably drunk, going towards Mysore at high speed, jumped the median and landed on the opposite lane bang ahead of the Tata Sumo that was in front of me. The Swift drove in the wrong direction and hit the Sumo head on. .... My Cedia had taken all the impact of the collision with the Tata Sumo and I was unhurt due to the seat belt keeping me in place and the airbags deployed preventing any head injuries." "... we flipped a total of 6 times. I'm not kidding. For me time kinda slowed down during the whole thing, so I counted the flips. The 6th flip took us off the highway and down about 40 feet into the fields, where the car came to rest on its right hand side. I was in the front left passenger's seat, and hanging from my seatbelt. Had to unhook myself and crawl out the front left window, which had gone. ... All said and done, all three of us in the car were lucky to walk away from this one alive. I don't know how any of us survived, to be honest. I've got one thing to say to everyone on this forum - PLEASE buckle up." "I was sitting at the passenger seat with one of my team member driving. I suddenly remember a huge thud and within no time the car was upside down. Villagers arrived from all directions and to my surprise they were not there to help us - however they were there to steal our valuables. Almost all of us lost our cell phones. I lost my watch which i brought using my first salary. All the occupants of the car walked out of the car with minor injuries, this mainly because of seatbelts." 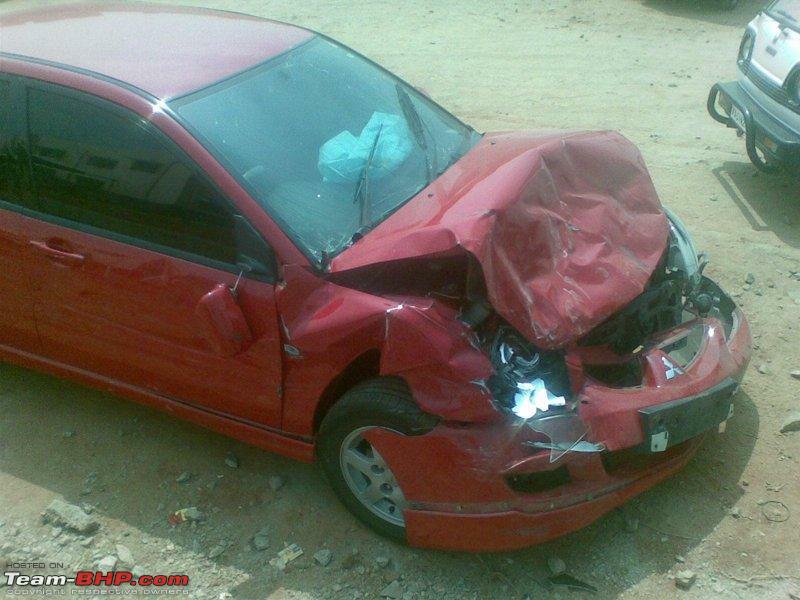 "Here's my Honda City that I crashed across a divider on a pitch dark rainy night near AFMC, Pune back in 2007. I got out without a scratch (just a sprain in the neck) due to my habit of harnessing the seat belt. 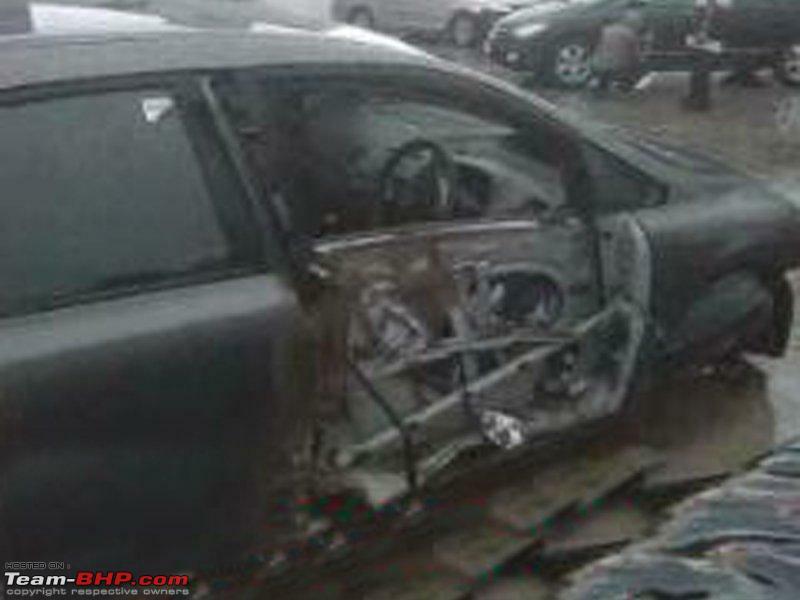 The side panels had been blown away and the bonnet had banged on the windshield before being totally crumpled. 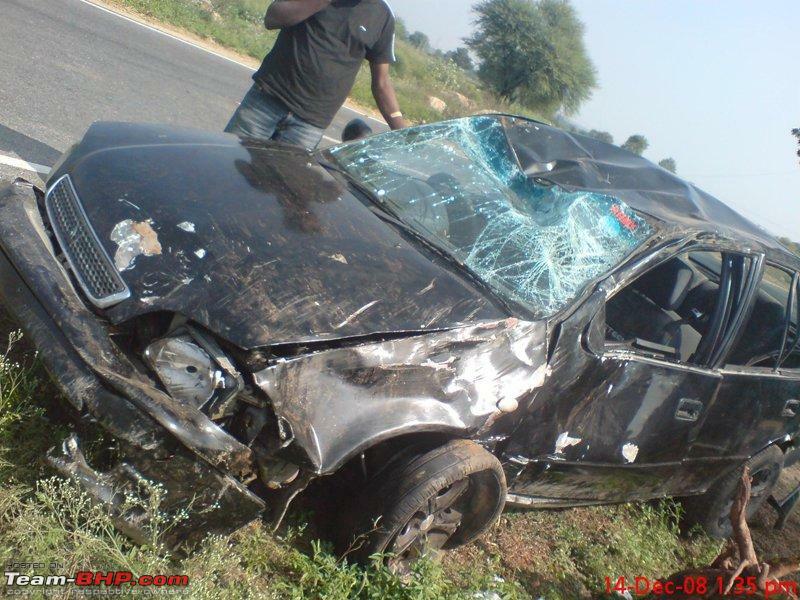 The car did a perfect roll mid air some 6-7 feet high and landed on its feet bursting all the four tyres." "The car skidded first to the left and then right and then the car hit the divider. BANG!! We are dead. That is what hit my mind. Then a lot sound, and I could feel the car going round and round. After a few seconds everything was silent. People gathered. They said the car had somersaulted 7 times. ... Fortunately we were both safe. Guess who was the hero of the day - "SEAT BELTS". If I wasn't wearing them I would have surely been thrown out of the windscreen. We both were wearing seat belts. We both had neck sprains because of the impact." "Seatbelt saved. This was the state of my Esteem after the accident. Nobody was hurt. A miracle!!" 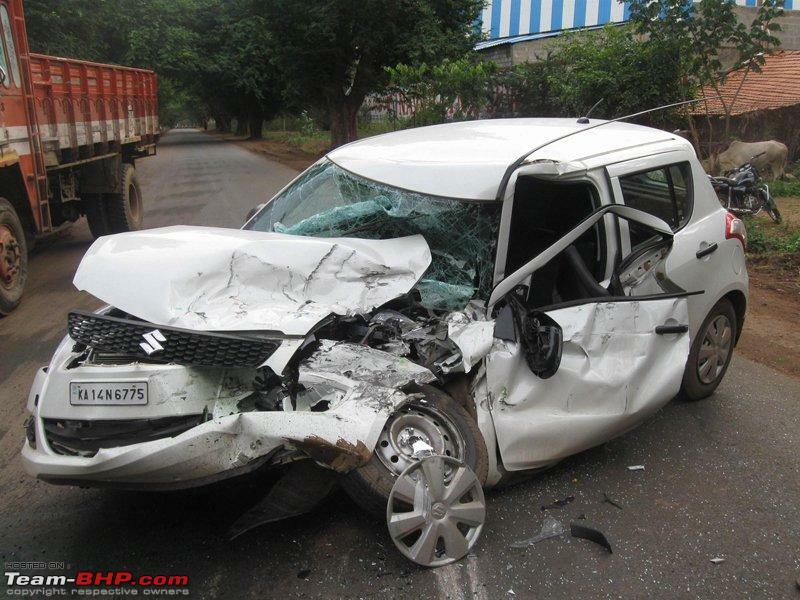 "A new Swift collided head on with a truck on Shimoga - Harihara highway. I have no idea how it happened. But the most astonishing fact about this incident was that there was no casualty at all. The person driving the Swift was not the owner but the driver and there was no passenger in the car. Had there been a front passenger in the Swift, then it would've been a different story altogether. The driver was shocked to say the least. He wasn't able to explain to me how the incident happened but told me that he "WORE" the seat belt (which definitely saved his life) . 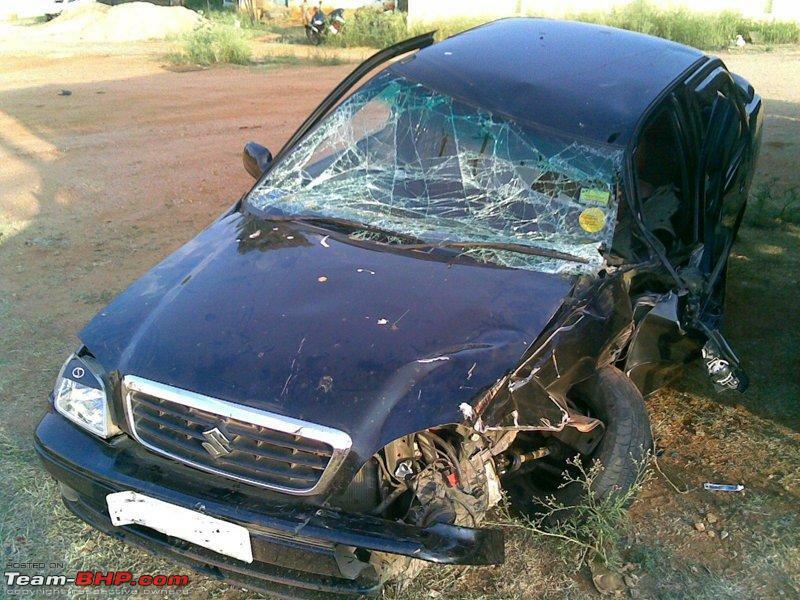 He was busy in narrating this accident to the car owner on the phone." 1st collision: Your car hits a vehicle or large object on the road. Naturally, this does the damage to your car. 2nd collision: As your car comes to a halt, your body is still continuing forward with the inertia, and finally collides with a part of the car’s interior (steering wheel, dashboard, windshield). This gives you bruises, cuts and broken bones. 3rd collision: As your body comes to a halt, your internal organs are still moving forward with some momentum. They finally collide with your rib-cage and other internals. This can cause ruptured organs, punctured lungs and internal bleeding. These 3 collisions happen in every accident. 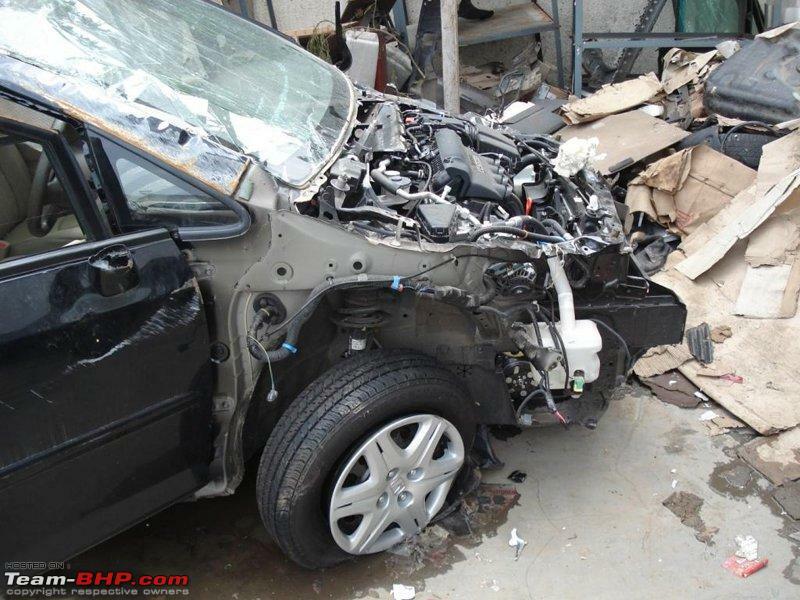 Seat belts greatly reduce the impact & damage caused in collision 2 and 3 by decelerating / halting the occupant at a slower rate, and preventing more vulnerable parts (like the head) from taking any direct impact. Even if a car takes several meters to come to a halt after an accident, it’s the short distance that the passenger takes to come to a stop in the 2nd collision (deceleration) that dictates the amount of impact force they'll experience. I won’t get into the calculations of this, but a basic understanding of this concept will help further on in this write-up. Yes. You read that correctly. The belt material is designed to stretch ever so slightly under extreme force. The advantage of this is, it further increases the occupant's stopping distance, thereby reducing the deceleration force they experience. Think about it, the difference between punching a cement wall and punching a wooden door is a tiny bit of flex. Other seat belt systems have "load limiters" which let out some extra belt when an immense force pulls on them. 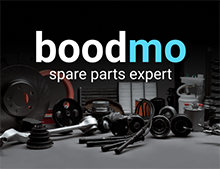 Load limiters can even be a fold stitched into the seat belt, which breaks the stitching and unravels more of the belt when it crosses a threshold force. Seat belts also help spread the force over a much wider area across the occupant's comparatively rugged rib-cage and pelvis, rather than a more concentrated & damaging impact to vulnerable areas of the body. "I don’t need a seat belt at these speeds." Contrary to popular belief, seat-belts are a great help even at speeds as low as 5 km/h. At 10 km/h, they'll probably save you a broken nose. It’s simple physics. The rapid deceleration that occurs during a car crash ends up acting as a relative multiplier for your body weight. Translated, if a 70 kg person is travelling at just 15 km/h, a crash would send him towards the windshield with a “crash weight” of around 407 kgs. Can a 70 kg person bench-press 400+ kgs, that too with getting their hands into position within a split second? No way! At 25 km/h, that value would increase to 1.1 tonnes. And at a lowly 50 km/h, that same person’s “crash weight” would be 4.5 tonnes. That‘s the weight of an elephant! Use this calculator to try your own numbers. Just remember that the “stopping distance” is actually the stopping distance for your body (not the car), which could be as little as 0.2 feet. "Don’t worry, this car has airbags." 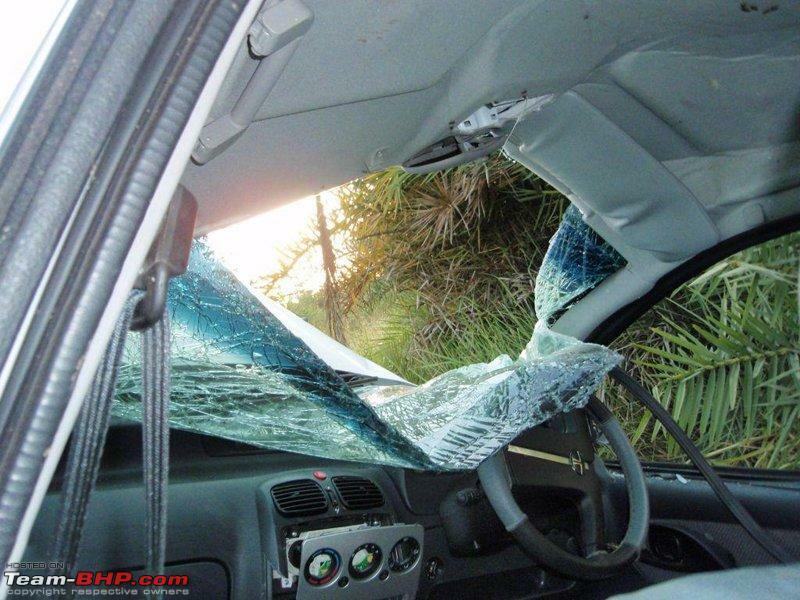 Airbags do provide added protection, but they are NOT a substitute for seat belts. 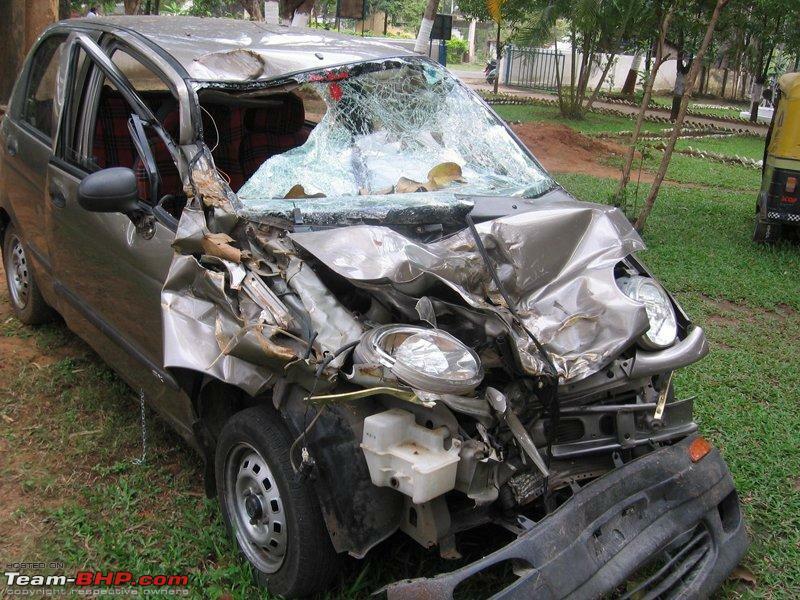 In fact, airbags can cause more damage (even death) when used without seat belts. They have been designed as a Supplemental Restraint System (SRS). Only when used together, does the combination of airbags and seat belts provide the greatest protection for adults. It is safer for both the mother and child if seat belts are worn by pregnant women. Just ensure that the lower band of the belt goes over the hips and pelvis (this means it should be below the belly, not across it). Also take care that your clothing or movements don’t cause that lap belt to rise up onto the belly. If possible, expecting mothers should be in the passenger seat (rather than driving themselves), as even a small impact from the steering wheel could cause problems in an accident. More info. "But I’m sitting at the back." Rear passengers are generally safer without seat belts, since the soft seat-back of the front seats helps cushion the impact of a low-speed crash. However, higher speeds will multiply the force and therefore, the potential for injury in the same situation. The center passenger at the rear is especially vulnerable, as they don't have a seat ahead of them, and are likely to get thrown straight into (and sometimes through) the windshield. 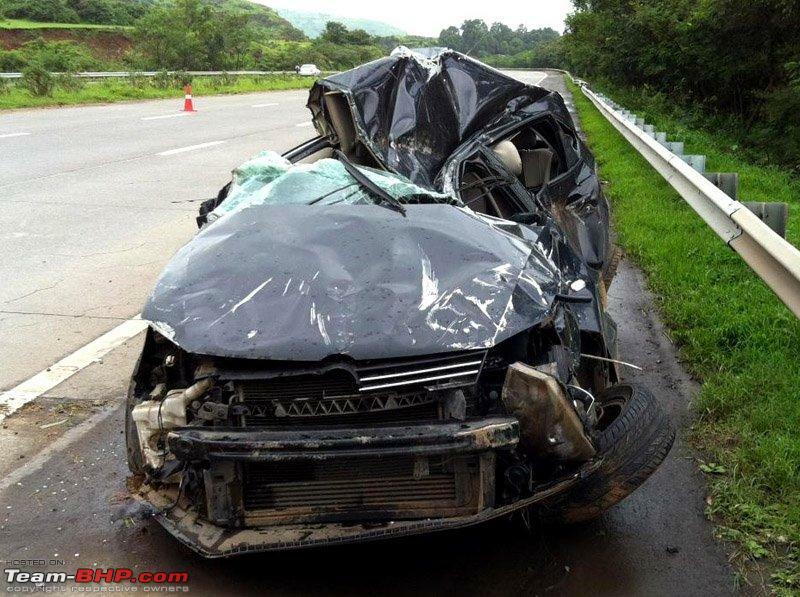 It’s always a good practice to wear seat belts at the rear, ESPECIALLY when on the highway. Another advantage of wearing belts at the rear is that it can keep passengers from being thrown out of the window during a roll-over (something that happens more often than you’d believe). Personally, I take every opportunity I get to buckle up on the rear seat, regardless of the driving speeds. "There will be no cops on the road to catch me." You should be wearing a seat belt because it will save your life, not because it will save you a 100 Rupee fine. The seat belt law is in place for a good reason. "What if my car catches fire and I’m trapped by the belt." Scared of being trapped in a burning car? Scared of driving off a bridge and drowning because your seat belts wouldn’t un-click? Well, don’t be. The simple fact is that seat belts are a thousand times more likely to save your life in an accident, than the chances of you ever being in a burning or drowning car. Even if your car does spontaneously combust or go for a swim, chances of the reliable and rugged seat belt latch malfunctioning are extremely low. "I’m only driving a short distance." Don’t tempt fate. There’s no telling when your luck can go bad. Also, there are dozens of studies concluding that more than 50% of accidents occur within 10 kms of the driver’s home. "I don't want to crumple my freshly ironed clothes"
"It’s too uncomfortable for me"
Are any of these really worth risking a life for? As the driver of a vehicle, it’s also your duty to educate, and ensure that passengers wear their seat belts. You can always politely offer them the option of walking or taking public transport if they are averse to seat belt use. Seat belts are life savers in most cases, but remember; driving smart and driving safe should always be your first line of defense!